A heartbreaking yet uplifting story of grief about a boy who has lost everything, but finds new hope drawing in the shadows of a hospital. Features a thirty-two-page graphic novel. Andrew Brawley was supposed to die that night, just like the rest of his family. Now he lives in the hospital, serving food in the cafeteria, hanging out with the nurses, sleeping in a forgotten supply closet. Drew blends in to near invisibility, hiding from his past, his guilt, and those who are trying to find him. His only solace is in the world of the superhero he’s created—Patient F.
"The Five Stages of Andrew Brawley broke my heart, then put it back together again. I truly loved this book." "A wonderfully written book that is more proof that the genre of 'LGBT YA lit' simply knows no bounds." 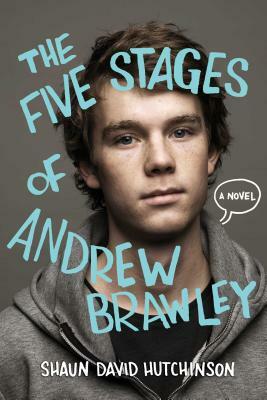 "The Five Stages of Andrew Brawley is as inventive as it is moving. A beautiful book." "Hutchinson builds believable secondary characters and presents unexpectedly fresh plotting and genuine repartee—the conversations among Drew and his two teen friends feel particularly real and are full of insight and humor. Hutchinson remains an author worth watching." "In this haunting tale of grief and recovery, [Hutchinson] spins an engrossing story, with Drew’s perceptions lending it an almost surreal, supernatural quality...further developed by violent excerpts from [the included graphic novel] Patient F."